Siemens articulated tram, no.505 at Belém, June, 2005. Please see below for a description of the coverage of Lisbon Transport on this site. 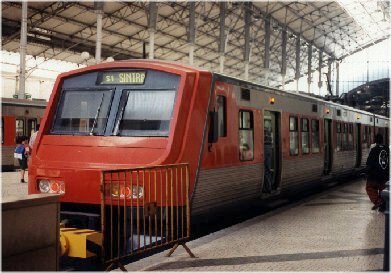 Fertagus double-deck EMU at Fogueteiro station, 2003. The city of Lisbon has an exceptional range of public transport, which includes trams (old and new), funiculars, a street elevator, river ferries (boats and catamarans), ships of all kinds (merchant and navy), underground Metros (one in Lisbon, one on the south bank of the Tagus), railways (suburban, national and international), monorail, cablecar, buses (city, suburban, national and international) and aircraft. Virtually all of these modes of transport have undergone major change in recent years, which makes them particularly interesting. And all are reachable within a half hour from the city centre. These pages also cover transport museums in the Lisbon area and include suggested day-trips by train from Lisbon and within Lisbon itself. Nearby, the historic town of Sintra has an historic tram route to the seaside town of Praia das Maçãs, which has recently been extended back towards the town centre, whilst across the river a light-rail system opened in 2007. Azambuja Line Railway - To Azambuja, along the Tagus estuary, via Alverca, home of the Air Museum. Carris - The Carris transport museum has many old trams and buses in its displays. Cascais Line Railway - The intensively served picturesque coastal route from Lisbon to Cascais, on which newly refurbished stock was recently introduced. 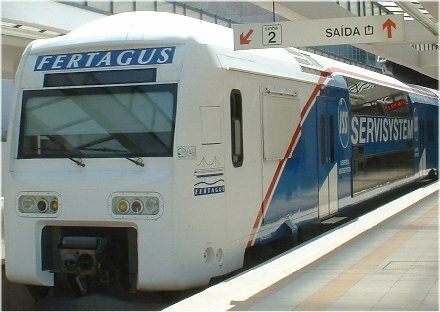 Fertagus Line Railway - The services across the Tagus via the Ponte 25 de Abril - now extended to Setúbal. Funiculars - The Glória, Lavra and Bica systems. Metro - Lisbon's underground railway system continues to expand each year. This page also covers the new (2007) Metro do Sul do Tejo. Metro do Sul do Tejo - the new (2007) metro on the south bank of the Tagus. Oeiras Monorail - The SATUO monorail at Oeiras just west of Lisbon. Railways - Lisbon's stations, including Rossio, Oriente, Santa Apolónia and Cais do Sodré. Rail Trips- Day trips by rail from Lisbon to towns including Setúbal, Tomar and Queluz. Sintra Line Railway - The 45-minute journey from Lisbon to Sintra. Trams - covering Lisbon tram services and stock, past and present. Bridges and Aqueduct - The impressive Ponte 25 de Abril and Ponte Vasco da Gama, across the River Tagus. Buses - Bus services by Carris, the Lisbon city transport operator, are included in this page, as well as the tourist services of Carristur. Carris - About Carris and its new transport museum. Lisbon Coach Trips; page under development. Museu dos Coches - A unique museum containing historic horse-drawn coaches. Suburban Lisbon Buses- with emphasis on the new terminal at Sete Rios, as well as those at Oriente, Campo Grande, Algés, Cascais, Estoril and Cacilhas. Taxis - Lisbon's taxi services are abundant and relatively cheap. Aviation - Lisbon Airport at Portela de Sacavém. Museu do Ar- The air museum at Alverca, a half-hour rail journey from Lisbon, with its satellita at Granja do Marquês near Sintra. Cablecar - Telecabina Lisboa runs a cablecar at the Parque das Nações. Street Elevator - The Santa Justa street-lift. There will also soon be information here on the Torre Vasco da Gama at the Parque das Nações. River ferries - Details of traditional ferry and modern catamaran services across the River Tagus. 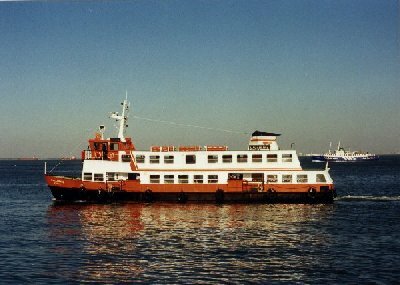 River Sado ferries are also depicted at Setúbal. Ships - The ships, docks and marinas to be seen in Lisbon. River traffic includes huge liners, cargo vessels, sailing ships, ferries and naval craft. L to R:Ferry Cacilhense; a four-wheeler tram, #713. 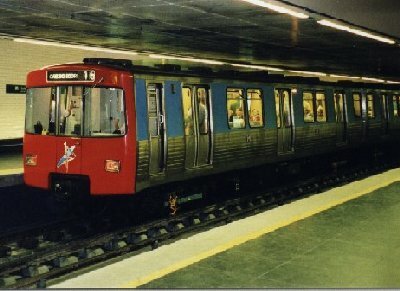 Museu da Carris - The Lisbon public transport museum, at Santo Amaro, which opened in January 1999, together with information about the Carris company and its services. Museu de Marinha - The Maritime Museum at Belém. Museu dos Coches A museum containing historic horse-drawn coaches. Left & right: Sintra Line EMU; Sintra-Atlântico tram. Click on images for larger versions. Sintra Transport. The royal town of Sintra lies only 45 minutes from Lisbon by train on the Linha de Sintra/Sintra Line railway. Apart from its scenic beauty, beloved of Byron, and its royal palaces, it has a fascinating historic tram service to the coastal resort of Praia das Maçãs, formerly operated by Stagecoach Portugal,but now in the hands of the local council who have extended it back from the depot to the town itself. A range of pages on Oporto transport is here. Lisbon has witnessed major developments in virtually all of the above modes of transport since the 1990s. The city has acquired a major new bridge (The Vasco da Gama road crossing), a greatly extended Metro system 9with new extensions still being built in 2009), new articulated trams, increasing us of catamarans for ferry services, with a new ferry terminal, and a brand-new railway station at Oriente as well as majot upgrades to others including Roma-Areeiro. In 1999 cross-Tagus rail services commenced using the lower deck of the 1960s' April 25 road bridge. These rail services are run both by the national railway company CP and, primaril, by the private operator Fertagus which operates from Lisbon to Setúbal. The former's rolling stock on these services includes Alfa Pendular (Fiat Pendolino) tilting-units, whilst Fertagus employs double-decker EMU trains. CP also uses its own double-decker units on the the Azambuja Line. The Lisbon Metro continues to expand both its network and its rolling stock and also has a newish railway/Metro/river ferry/tram/bus interchange at Cais do Sodré. On the southern bank of the Tagus is the Metro tranportes do Sul centred on the town of Almada. Since mid-December 1999, a second fixed railway crossing has been mooted; this would run between Chelas in northern Lisbon and Barreiro on the south bank of the River Tagus and would serve the proposed new Lisbon airport near Alcochete. In the suburbs, a monorail has been opened at Oeiras whilst at Sintra, there is the famous tram line to the coast. A contactless ticketing system is also in operation serving most of the modes of transport in Lisbon itself. From left to right: The Lavra funicular; the Lisbon Metro. Click on images for larger versions. 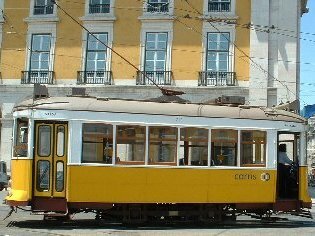 For details of transport tickets for use by tourists in Lisbon, please see the Carris page. Also, Transporlis is a useful portal covering all modes of Lisbon transport which contains timetable and fares information. AMMOS - Acesso Multimodal Multimédia Orientado para Serviços is a Lisbon transport portal to which Carris, Transtejo, Metro, CP (Portuguese Railways) and ANA (Lisbon Airport) all contribute. It provides maps, service details, etc. LRTA, the Light Rail Transit Association has a new Web site and its monthly journal, 'Tramways and Modern Transit' provides updates on developments in Portugal. The European Railway Server is a mine of photographs of Portuguese transport, including trams and trains of Lisbon. The Associação Portuguesa dos Amigos dos Caminhos de Ferro, APAC has a useful site for those who read Portuguese. APAC also published the monthly 'Bastão-Piloto' magazine which had a section on trams in every issue, as well as many railway articles. However, this publication now seems to be defunct. Comboio: The Portuguese Railways Group has a useful site for enthusiasts. Information on Portuguese railway traction is also available. Lisboa em movimento. 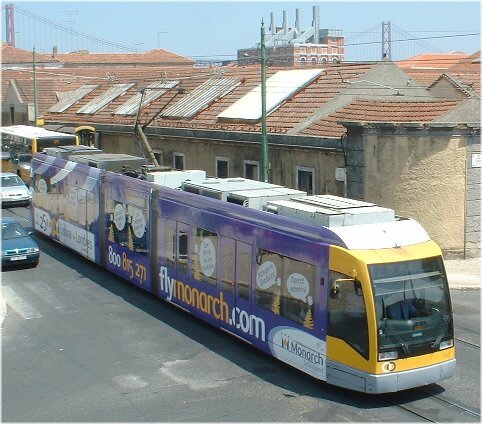 A Portuguese site on Lisbon transport. Os Amarelos, Emídio Garde's excellent site on Lisbon trams. O Comboio em Portugal, a Portuguese railway site. Comboios de Portugal Another Portuguese-language site. Although now a little out of date, this little book is a useful source of background information. It is illustrated by black and white photographs and maps. J. Lagrange and A. Alçada Baptista, O livro da Carris; The book of Carris. 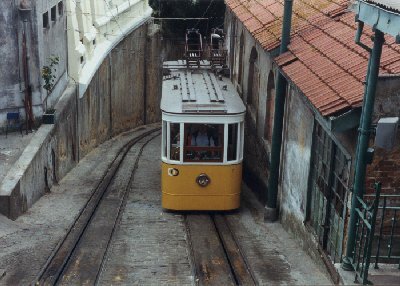 Lisbon: Carris, 1993. 98pp. A bi-lingual, Portuguese and English, book which depicts in colour selected trams, buses and funiculars of Lisbon. Aeroportos e Navegação Aérea, Lisbon Airport, 1942-1992. Lisboa: Inapa/ANA, 1992. 189p. A celebration of Portela de Sacavém airport, Lisbon, on its 50th anniversary. This is a well-illustrated volume produced by ANA, the Airport's operator. ANA also produce a regular glossy newspaper in English and Portuguese, called Imagem and available free at the airport. N.C. Baldwin, The Lisbon story. Sutton Coldfield: The Aero Field, 1965. 10pp. An account of aviation in Lisbon from 1922, when Sacadura Cabral and Gago Coutinho flew from Belém to Brazil, up to 1968 when flying-boat services from Madeira to Lisbon ceased. A most informative guide, with many archive photographs in black and white and colour. A revised printing appeared in 1998 of this essential guide to Lisbon and to other Portuguese tramways. There are also brief sections on the Estoril Line railway, funiculars, the Metropolitano de Lisboa and the Sintra tramway. Illustrated with many black and white photographs, this book gives historical detail, fleet lists and up-to-date information. J. Abdo, Tram tours of Lisbon. Lisbon: Represse, 1991. 98pp. maps. A superb little book detailing every stop of the then extant tram routes of Lisbon, illustrated by high-quality colour photographs. G.E. Baddeley, The Continental steam tram. London: Light Rail Transit Association, in association with The Tramway and Light Railway Society, 1980. 280pp. 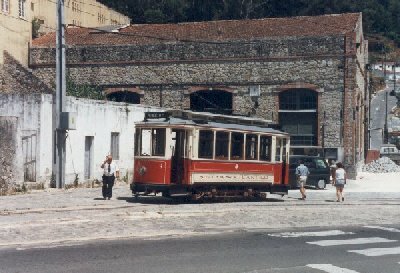 Chapter 10 covers Portugal (pp.235-54) including the Larmanjât steam tramway. A well illustrated bilingual history of Lisbon's tramways. A superbly illustrated history of the Lisbon ferryboat, with copious details of the modern fleet. Luís Miguel Correia, Cais e navios de Lisboa. Lisbon docks and ships.. Lisboa: Edições e Iniciativas Naúticas, 1996. 93p. With parallel texts in English and Portuguese, this is an attractive collection of the author's colour photographs of a wide variety of ships and boats which have visited or inhabit the Tagus near the city of Lisbon since 1975. Manuel Leitão, Boats of the Lisbon river: the fragata and related types.. 2nd rev. ed. London: Trustees of the National Maritime Museum, 1980. 154p. bibliog. A comprehensive guide to traditional Lisbon river boats. The most comprehensive guide to Portuguese railways available in English, but riddled with spelling and typographical errors. Black and white photographs illustrate the text. This exhaustive work necessarily concentrates on northern Portugal but there is coverage of the Larmanjât steam tramway which served Torres Vedras from Lisbon. A full colour collection of evocative photos. An excellent, heavily illustrated guide to the subject. Despite its title, barely twenty pages of text of this book cover Portugal. The only Lisbon station covered is Santa Apolónia, but there is a brief section on the Metro. John R. Walker, Broad gauge steam locomotives of Portugal. Liversedge, Yorks: Hartshead Publishing, 2005. 103pp. bibliog. Useful survey of its subject, despite many typographical errors. Neil Webster & Philip Wormald, European loco pocket book, volume 2: France, Greece, Portugal, Spain.. Batley, England: Metro Enterprises, 1993. 2nd ed. 1280. Includes fleet lists of Portuguese railway locomotives. D.W. Winkworth, Railway holiday in Portugal. Newton Abbot: David & Charles, 1968. 158pp. bibliog. maps. Chapter nine covers Lisbon and Sintra, with the emphasis on local and suburban routes. Today's Railways, published monthly by Platform 5, Sheffield, England. The July 1998 issue has a lengthy article on the Lisbon area's railways. The July and August 2000 issues carry an extensive of modern-day Portuguese railway operations, in full colour. Buses, published by Ian Allan of Shepperton, Middlesex. The February 1997 issue, for example, included an article on Stagecoach Portugal. Ticket to ride: out & about Lisbon. A 60 minute video, available from FHP Audio Visual, Hayfields, Upton Scudamore, Warminster, BA12 0AE (England). Covers virtually all aspects of Lisbon's public transport, though it does not include the Sintra tramway. An excellent overview which is only marred by some abysmal pronunciation of even straightforward Portuguese place names and a number of spelling errors on the maps which the video contains. Make sure the tab below is set to "This site" and then enter the name or word you are seeking. Then, click submit and all matches to your search term will be displayed. Alternatively, set the tab to search "The Web" and a search will be made across the whole internet. Please bear in mind that indexing is only done periodically so very recent matches may not be displayed.